WTF: Watching outfielders collectively avoid flyballs… again. The old adage “if it ain’t broke, don’t fix it” can only go so far. As The Show is practically the only baseball game in the town (unless one considers the inferior arcade-style RBI Baseball as an alternative) we’re pretty much held hostage when it comes to playing console hardball. The good news? Developer San Diego Studios continues to put out a gorgeous, robust baseball offering each year. It looks stunning, packs an incredible amount of content, and features active updates and online communities. The bad news? Changes and improvements are negligible from year to year, and too many irritations are never ironed out. It’s so much ‘business as usual’ that I can almost copy and paste last year’s review in place of this one. That said, players who are coming to this series for the first time will likely be amazed. As in previous iterations, The Show 18 looks better and better each year. These are easily the best character and stadium models to date, and likewise for the most robust in-game quirks — things like individualized player batting stances and subtle hometown rituals. It’s the type of game one can appreciate as much from watching as by playing. Diamond Dynasty – The Show’s popular card-collecting mode – now contains new legendary players. These facial models are stunning, and it’s nice that several (albeit lower-ranking) cards are unlockable from the start. Still, Diamond Dynasty remains a microtransaction cash grab for ‘stubs’ needed to purchase/collect better players and collectibles. Otherwise, the most notable Show mode is the one no longer in it. For some strange reason, Season mode no longer exists, and its absence removes what would likely have been the biggest draw for solo players. I suspect The Show will lose a lot of its audience due to this baffling omission. 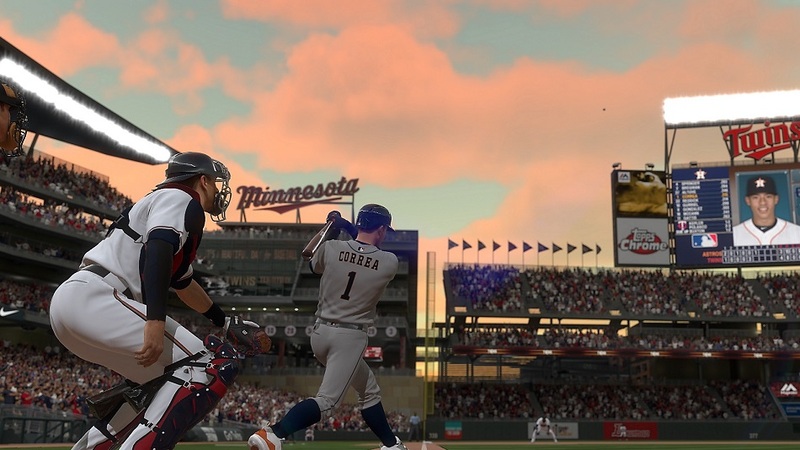 Road to the Show – The Show’s ‘build a character’ mode and my personal favorite – underwent a major adjustment. Players now select a specific skill set to build from, and points are no longer the currency of advancement — instead, it’s skill gains. Personally, I like this shift, as grinding was never a task I looked forward to. Others may find this dramatic change a bit off-putting. In terms of the mechanics of play, it’s more of the same Show with few exceptions. The upgraded tutorial system is a nice touch, and better educates players on different ways to tweak pitching and hitting options. Why the reticle hitting option was replaced with a yellow plate coverage indicator is beyond me. The new zone feedback display (on timing/angle/speed) after each pitch is pretty cool. Hitting feels a bit more natural, as pitches more logically move through a zone based on selection and rotation. It’s therefore easier to spot balls, strikes, and time hits to pick spots. However, pitching remains exponentially easier to master than hitting, regardless of interface. It’s for this reason I recommend solo player hitters employ the ‘quick counts’ option (when balls/strikes are pre-determined before first hit attempt). This not only speeds up the game, but better randomizes gameplay. Baserunning and fielding – while slightly improved – remain problematic. Runners will now naturally tag up on fly balls, but also run themselves into stupid double-plays stemming from little league logjams at a base. Second, the CPU will almost never steal a base on behalf of the player, even with baserunning set to ‘auto.’ Fielding-wise, infielders more naturally move to balls, but outfielders still cross paths and misplay gap shots. Presentation wise, there are subtle graphic glitches (players getting stuck in an animation after striking out, hair being seen through hats, etc) but they don’t impact gameplay. The audio commentary can be repetitive, but it’s basically in line with prior titles. San Diego Studios did add another voice to the commentary (it’s now a 3-man booth) but this addition isn’t noticeable except in rare instances. Disclosures: This game is developed by San Diego Studios and published by Sony Interactive Entertainment. It is currently available on PS4. A download code for the game was obtained via publisher and reviewed on the PS4. Approximately 20 hours of play were devoted to single-player and multiplayer modes. Parents: According to the ESRB, this game is rated E. There are no descriptors. 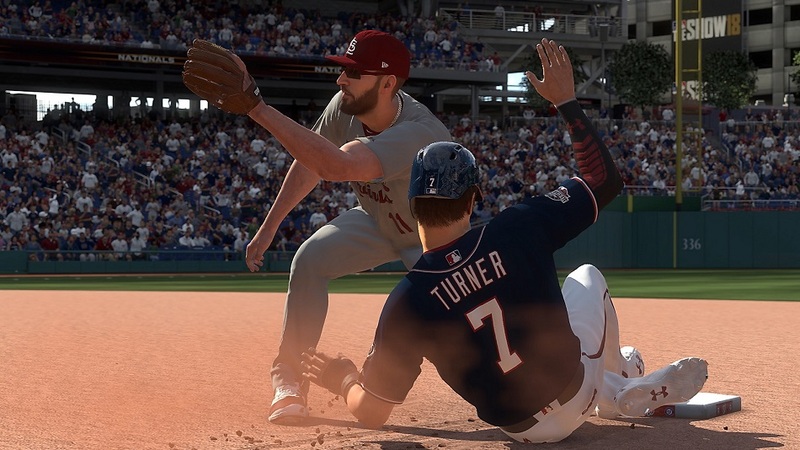 This is a baseball simulation game in which players compete with Major League Baseball teams in a number of different modes (e.g., Franchise, Road to the Show, Home Run Derby). Players can adjust an athlete’s power and precision while pitching or batting, and can initiate defensive strategies while fielding. Deaf & Hard of Hearing Gamers: This game features subtitles, and there are no audio cues necessary for successful play. It is fully accessible.